Although Arthur Foote's String Quartet No.1, dating from 1884, bears the low opus number of 4, Foote was thirty years old and this was clearly not his fourth composition. 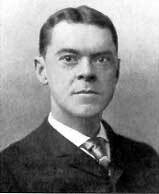 Arthur Foote (1853-1937) was born in Salem, Massachusetts and was the first important American composer trained entirely in America. His main teacher was John Knowles Paine, from whom Foote gained an admiration for and was primarily influenced by the leading Central European Romantic composers of the day, such as Mendelssohn, Schumann, Dvorak and Brahms. After graduating, Foote became active in the musical life of Boston and made his living primarily by teaching the piano. He was fortunate in having friends and supporters who were able to arrange for his larger compositions to be performed by the Boston Symphony. Foote wrote approximately 200 works, most of these for voice. Roughly 75 have opus numbers. Though chamber music comprises only a small part of his output, these works are among his best. The dramatic opening Allegro appassionato, has all of the hallmarks of an experienced and sure hand. The lively Scherzo, Allegro vivace, combines American melody with Central European compositional technique. The subdued and more lyrical trio is a fine addition to the movement. It is in the lovely Andante con moto, that we can hear Foote's great skill as a vocal composer and fine melodist. The finale, Molto allegro, begins in an almost explosive fashion, but the second theme, a kind of New England folktune, is more lyrical. The the interesting development section sounds a bit like Mendelssohn and the conclusion is full of excitement. We are pleased to present an all new edition of this fine work. Edited by Skyler Silvertrust, it is the first new edition since its original publication. We believe that the only reason this quartet has has never received the audience it deserves is because it was written by an American who was “out of the loop”, far away from the main music centers of Vienna, Berlin, London and Paris. But this work is in no way inferior to its European counterparts from the same period. Certainly American quartets, at the very least, should add it to their repertoire. It will surely be an audience pleaser. Amateurs will find it highly enjoyable.